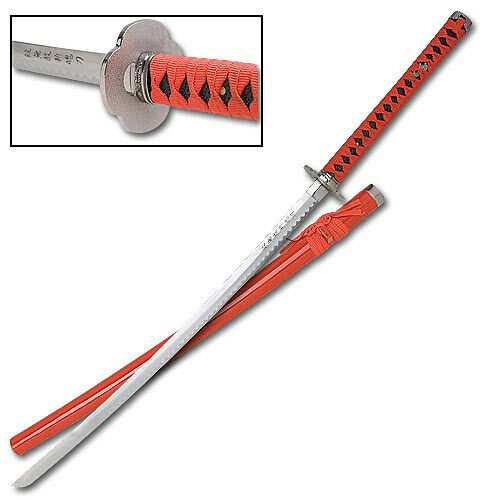 Red Dragon Samurai Ninja Katana Sword | BUDK.com - Knives & Swords At The Lowest Prices! This excellent sword is a tribute to the katana's popularity as both a weapon and an elegant cultural piece. This katana measures 41 5/8" overall and features a 26 1/2" heat tempered carbon steel blade. The hilt offers imitation black ray skin with red nylon cord wrapping. The handle is constructed of cast metal parts. It IS full tang. The steel is pretty thin so probably not meant for cutting heavy objects like "gallon water bottle" or Bamboo. The blade doesn't come sharp so you will have to sharpen yourself. I purchased this on the BOGO deal and am happy about the results. The package did come one day late however.. when it's a 3 hour drive from my place to BUDK warehouse..
Great sword only issue i had was the second sword i got,it had a blemish on the scabard and a crack at the top of it.I called and they are sending a prepaid label and i just need to send it back and they will send a replacment! I got these on bogo which I thought was a great deal as these are $29.00 on other site just for one. The blades are thin, one is bent and the handles are plastic. There is no fake ray skin just sharp dimpled plastic under the nylon wrap and it doesn't feel like it's full tang. On one the kashira or but cap wasn't attached. Overall really a wall hanger. THE PHOTO IN THE DISPLAY OF THIS KATANA IS HORRABLE COMPAIRED THE BEAUTIFUL RED COLOR OF THIS SWORD ! MAMA ROSIE AND I ORDERED FRIDAY AND GOT IT TUESDAY (TODAY). OPON UNBOXING THESE, WE DISCOVERED THE LOVELY RED KATANAS . THEY ARE HEAVIER THAN OTHERS IN EACH OF OUR COLLECTIONS . WE ARE VERY PLEASED . ( BOGO WAS A NICE TOUCH AS WELL ) THANKS BUDK ! Carbon steel, full tang construction, very attractive...what are you waiting for? This is a decorative sword that can easily do double duty in a defensive situation. Not especially sharp, but I still recommend it. I needed something flashy for a space on my office wall. The Red Dragon Samurai Katana is perfect. The price was right. All I wanted was an inexpensive sword to complete a Holloween costume. I ordered a very inexpensive one so I was concerned if it would be adequate. It was very nice. Don't know how they can sell it so reasonably.